Video Recipe - The best piece of meat on the pig is the neck roast. Tender and fat marbled. If you cook it properly, it becomes so tender that it can be pulled apart with two forks. A short stay in the grill make for a a mild bacon flavor. This recipe is ideal for guests. Most of it can be done a long time in advance. It's just as easy to make four as it is to make one. It's hard to do wrong, and everyone is surprised at how well pork can taste. It is also excellent for dinner later, in a good home-baked bun. Put the meat into the brine. It is a good idea to put a plate on top to keep it well covered. Let it marinate for 12 hours in the refrigerator. Prebake, can be done the day before. Put it in a covered pot, roaster, roasting pan or similar. Otherwise, place it in a tray and cover with baking paper. Just make sure that the pan has roughly the same size as the meat. This prevents it from drying out. Bake it for 8-10 hours at 90-100°C (180°F-210°F) When it so tender that you can press your finger (or the end of a wooden spoon) into the meat, it is done. When I do it, I usually let it marinate in the morning and then put it into the oven in the evening just before going to bed. When I wake up, the meat is then fried to perfection. If it is not quite finished, or need a few more hours and you have to hurry to work, then you can fix it by giving it a little extra in the grill later. Now you can then take a break and save it for the next day or freeze it down and keep it for longer. When you need to serve it, then let it grill for 1-2 hours with only one coal holder in use, or in an oven at 150°C (300°F). The time depends on how tender the meat was initially. When the surface is brown and crisp, and the meat can be pulled apart with a fork, it is finished. Throw a good handfuls of wood chips or woody herbs, like rosemary on the coals. Or put a piece of firewood of hardwood on top of the coals, so it smokes. Beech, birch or fruit tree wood for example. Pulled pork can easily stand the more powerful smoking that wood offers. It will be more bacon-like tasting. It is always a hit to serve the meat in one piece, only with a fork and a spoon to take it apart. 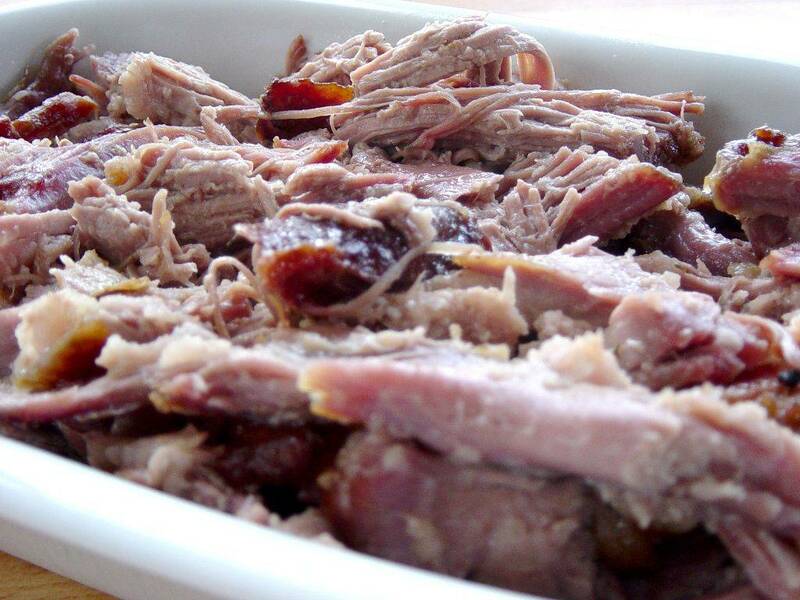 Everyone loves meat that can be pulled apart that easily. To make it taste even better and to make the meat more juicy, you can pull it apart so that it lies in the "stringy" pieces in a serving pan. Then you pour a good strong stock in the pan too. Most of the stock will then be absorbed by the meat, which will have an even stronger and more succulent flavor. You can use the exact same recipe as this for leg of lamb. I often do this.